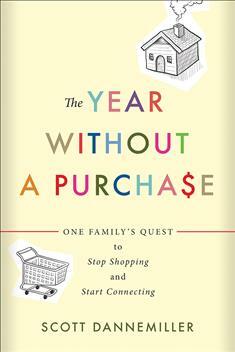 The Year without a Purchase is the story of one family's quest to stop shopping and start connecting. Scott Dannemiller and his wife, Gabby, are former missionaries who served in Guatemala. Ten years removed from their vow of simple living, they found themselves on a never-ending treadmill of consumption where each purchase created a desire for more and never led to true satisfaction. The difference between needs and wants had grown very fuzzy, and making that distinction clear again would require drastic action: no nonessential purchases for a whole year. No clothes, no books, no new toys for the kids. If they couldn't eat it or use it up within a year (toilet paper and shampoo, for example), they wouldn't buy it. Filled with humorous wit, curious statistics, and poignant conclusions, the book examines modern America's spending habits and chronicles the highs and lows of dropping out of our consumer culture. As the family bypasses the checkout line to wrestle with the challenges of gift giving, child rearing, and keeping up with the Joneses, they discover important truths about human nature and the secret to finding true joy. The Year without a Purchase offers valuable food for thought for anyone who has ever wanted to reduce stress by shopping less and living more. Want more information? Click here to download the FREE Guide for Study and Reflection. "This book—playful, thoughtful, substantial—is a must-read for North American Christians who are purposing to pattern their lives after the person of Jesus. It provides an honest glimpse into one family's experiment in living more simply and charts a path for the rest of us as we attempt to live faithfully in the world today." "Often hilarious and always thought provoking, Scott Dannemiller deftly peels back the layers of what we want, what we think we need, what we actually need, and who we really are underneath it all. You'll finish this book motivated to do more with less and feeling like you've just had a very satisfying conversation with a good friend about what really matters in life. Hint: It's NOT 'stuff!'" "The Year without a Purchase is as compelling to read as it is challenging to personalize. Very few books can actually change your life, but this is absolutely one of them." "In bite-sized morsels of real-life struggles iced with wit, candor, and faith, Dannemiller serves up a way of life in which you learn to like the taste of living with what you have and reducing your helpings of a gluttonous spending in order to live a life in community and service."